The Loft: Bedroom - Goodnight Starshine. Aside from Pillowland - I would have to say that our Bedroom is my next favorite place to disappear to. It's the brightest area in our loft - as diffused light floods the space in the mid-morning - which is great when you're lounging around on a Saturday morning. However, John's " in complete darkness" sleeping pattern has definitely changed since moving into our loft. Trying to design a sleeping space that would accommodate both of our aesthetics didn't seem too difficult. Then, we sat down and talked about colors and style - boy, were we wrong - we were all over the place. John was drawn to the industrial, focusing more on masculine pieces, darker colors with a splash of color - his favorite, burnt orange. I, on the other hand, preferred light & soft colors, with a focus on textures and mango wood - all that drew from a beach-side type of living. John understood that he had given me "free-range" to decorate our loft as I saw fit. But he still wanted to feel like he was still part of some of the design aesthetic. Luckily, we found a happy medium. With our bed situated away from the wall - we had enough space to keep the area feeling light and airy. We kept to darker fabrics that had a very simple pattern - with neutral accent pillows to create a bit of depth and texture. 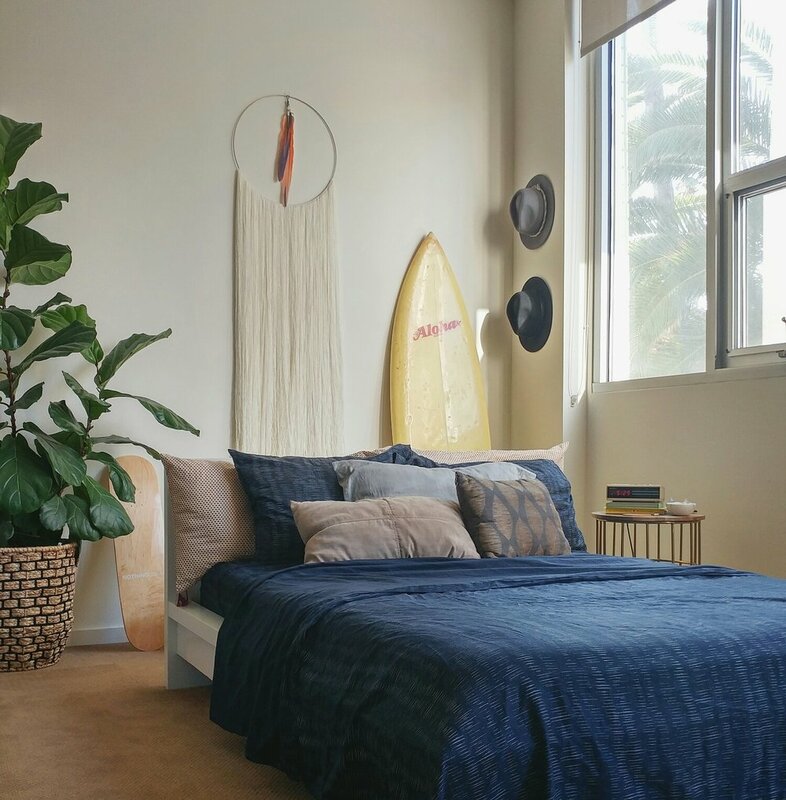 Since our walls were white - it played for a perfect backdrop to display my second-hand yellow surfboard as well as a familiar piece that once hung in Pillowland. My DIY wall hanging was moved during the Holiday Season - since most of it would have been covered by our Christmas tree. However, after we took down the tree - we decided that the wall hanging was a better fit on the wall, behind our bed. Other items added to our sleeping area was a mango wood topped circle side table, one of John's "plant babies" - his fiddle-leaf fig tree "Phineas," a few Brixton hats, & a skate deck from our friend's shop Nothing Usual in Downtown Santa Ana.